The Statue of Liberty boasts a rich history. In this collection of 15 vintage-photograph postcards, Barry Moreno explores the landmark's past. An expert on the topic, Barry Moreno is the author of several books, including The Statue of Liberty Encyclopedia, Images of America: The Statue of Liberty, and Statue of Liberty: Wonder of the World. 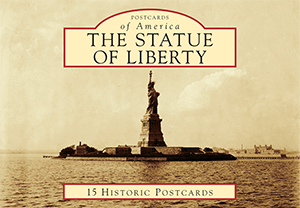 Over the years, he has collected many postcards and other Statue of Liberty memorabilia. He is also the author of The Illustrated Encyclopedia of Ellis Island and Manhattan Street Scenes. © Copyright 2016 Arcadia Publishing. All rights reserved. Please wait while your product is added to the cart.